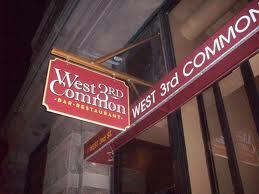 Visit West 3rd Common to enjoy some of the best burgers in nyc, a favorite with many of our customers. Order one and pair it with your drink of choice for some of the best bar food in Greenwich Village. What's more classic of a combination that a delicious burger and ice cold beer? We can't think of much. Our burgers are a crowd favorite and we have an extensive beer menu that is sure to have a brew for everyone to enjoy.Check out the rest of our menus to see the other delicious food that we offer. Whether you are just looking for a great spot to have a drink with friends or an NYU college student in search of a local hangout, West 3rd Common is one of the best beer bars in NYC and the best place to kick back with a drink. Check out our extensive beer menu below and drink which beer you're going to enjoy.